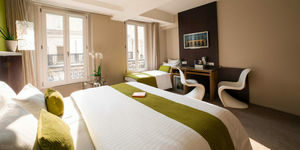 This 4* boutique-hotel is considered a haven of peace and serenity located in the heart of Paris. Whilst a recent refurbishment ensured the inclusion of all modern and high-tech facilities, the marble surfaces, oak parquet flooring and Murano mosaics have preserved its intimate Parisian charm and spirit. This hotel is chic and charming, just like your stay in Paris. 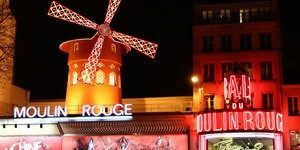 Five minutes’ walk to the Bohemian and mythical area of Montmartre and the Moulin Rouge and only a further five minutes to the transcendent sights of the Opera House and the iconic Sacre-Coeur, the Hotel Beauséjour is an ideal location to explore and experience Parisian history and culture. The hotel is easily accessible, as the métro station Place de Clichy is on your doorstep and is well connected to the rest of Paris’ underground. The Hotel Beauséjour radiates a warm and welcoming atmosphere, enhanced further by the multi-lingual, friendly reception staff, who are always on hand to tend to your needs. The hotel’s pièce de résistance is its stunning private garden, with an outdoor heater and exotic palm trees. 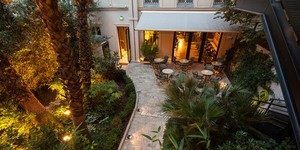 This green Eden is complimented by the hotel’s lavish lounge bar, which offers a peaceful retreat to the bustling streets of Paris at the end of the day and an excellent wine list. Breakfast is included and promises to be a truly delightful experience. Each of the spacious and well-equipped Classic and Superior bedrooms are renowned for their comfort and quality. With décor ranging from hip and trendy to relaxing and tranquil, you are sure to find a room that suits both your tastes and personality. 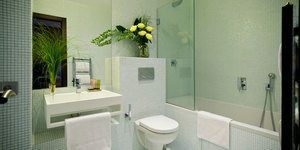 All of the rooms are en-suite and include a mini-bar, air-conditioning, complimentary Wi-Fi and a welcoming hospitality tray. The hotel also offers Privilège rooms as well as Business and Junior Suites if desired.